Some might say concrete is colorless, dull and boring, while others – like the professionals at Templin Concrete Construction – might say that it’s anything but! We know how to make concrete visually appealing and truly unique using decorative concrete techniques and styles! Concrete can be used to create just about anything, from driveways and walkways to patios, garage floors, sidewalks and so much more. If you want a beautiful patio, don’t settle for simply pouring solid concrete in your backyard and calling it a day. Your patio can display color, a unique pattern and many other characteristics to make it truly stand out. Where there’s a will, there’s a way to make concrete look unique, and we know how to make that happen! Yes, it’s true – not all concrete has to be the traditional boring gray color. We can add colors to the mix to create a color you’d like to match your home’s style, landscape and your budget. By adding a colored walkway or patio to your front yard, passersby are sure to take a second look. By engraving your existing concrete, you can boast unique designs and patterns. With the right pattern, your concrete can look like cobblestone, tile or flagstone. Get all the great visual appeal of a textured walkway without the labor and cost. With all different kinds of patterns and colors to choose from, your walkway, pool deck or patio made of stamped concrete is sure to make your neighbors green with envy. It looks like anything but traditional concrete, and is it’s full of color and life. It even emulates the look of an extravagant path or sidewalk that was laid stone by stone but without the back-breaking work. 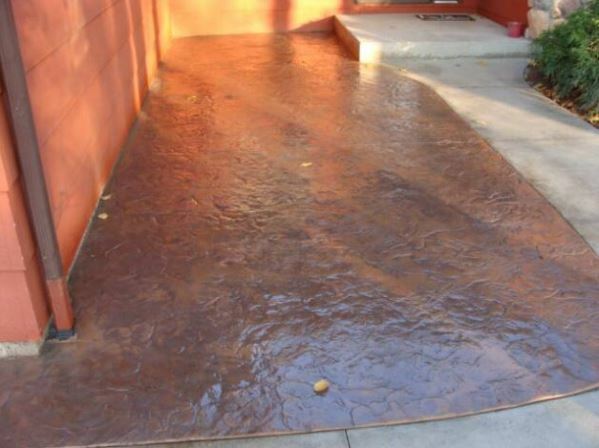 A sealer can give your stamped concrete a stunning “wet look.” Don’t worry, your walkway or pool deck might look wet, but it will be slip-resistant. Beyond adding a unique look, concrete sealers also protect your concrete investment from everyday wear and tear, stains and heavy foot traffic. Sealant can even enhance the color of the concrete, ensuring it looks beautiful for many years to come. If you want to transform your home’s curb appeal or take the landscaping in your backyard up a notch, turn to the professionals at Templin Concrete Construction. We can make concrete look stunning in any application! Learn more about our decorative concrete services by giving us a call today at 612-388-1945.